The aim of this exhibition was to create a modern museum within a heritage building over two floors, broken into a complex of individual site-specific rooms that flow as a coherent and informative whole appealing to a broad range of visitor types. 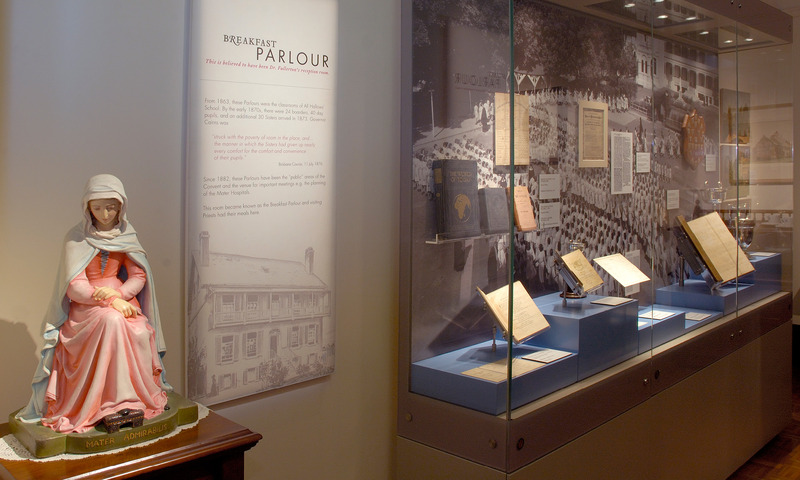 Our initial approach to this project was to, where possible, return the rooms to focus on their former use including placement of statues and furniture in the locations that they had historically occupied – and then to position the introduced exhibition elements as a discrete layer within these historical rooms. Interpretive joinery and showcasing was developed with a clean and contemporary design language to be read as separate from the heritage elements. Dramatic and localized lighting has been used throughout the museum to create rhythm and drama to draw visitors through the exhibition. Interactivity and audio-visuals have also been used to animate the stories and immerse visitors in the content. The development of this exhibition was a complex and evolutionary one where we worked closely together with Mercy Heritage’s curator/director Peter Connell over a five-year period.